Name tags sizes, best examples, design tips and tricks. Name tags are name cards that display a name of the holder and the key info such as a job title, a business name, a company logo, a type of his/her occupation (for example, school class name, membership status, access permission level, etc). How to create a Name Tag. 1. Go to the Name Tag related section of the MakeBadge. 2. Choose a most suitable free online template or download a Premium name tag template. 3. Customize it Online or using your own software. 4. Print your artwork directly on your printer or save and print in the nearest print shop. 5. Cut the results and use! “Hello, My name is _____” name tag template is the most standard name tag sample. But beyond classic name tag, there are over 80 name tag design templates! Name tag is a sort of name badges that distinguish from other business cards or labels. Name tag does not contain a lot of contact details. The goal of this document is to provide a brief introduction. Thus, name badges serve as a small talk to start communication. Typically, waiters, bartenders, salespersons, hotel employees wear name tags. Since the tags do not show much info, usually they go along with an employee picture ID or a business card. name stickers for clothes or lapel tags. Each tag type has its peculiarities and is available for design with name tag maker. MakeBadge enables you to prepare several name tag design samples. A traditional name tag template includes a person’s name and job title. The content of this name badge kind is limited and standardized. The popular name tag templates are based on “Hello, my name is ____” name badge model, where you can substitute the blank field with your hand-written employee name. Try our tag maker with this sample, download an editable templates and print most suitable one for your staff without money waste. Along with a regular name tag template, there are options to create custom tags online. Don’t stop your talent and make personalized stickers for each member of your team. Creative tag design that goes beyond Microsoft Office tag template will differentiate each person that wears unique tags on his/her lapel. MakeBadge online name tag maker helps change background color; adjust shape and dimensions, choose specific font and writing style and offers more custom design options that are rare for free name tags. Employee tags are indispensable satellites of all small business companies. Employee name tag templates are divided into 2 key categories: personalized employee ID badges and reusable employee tag templates. MakeBadge is a good free solution for both name tag making methods. Anyway, when you work in a service-oriented company, a helpful employee name tag, no matter custom or sample template, turns out to be a communication tool between employee and customers. Together with employee, luggage tags, name tags for kids are the cards that you can make with MakeBadge name tag online software. The tags for kids differ from ordinary name cards with joyful design, less content and more attention to nice custom tag template. Here are a few name tag templates for school kids that might be useful when making personalized tags for children. When you make ids, be sure you will get printable name tags. Each name tag is prepared for printing. If you use our free name tag maker, the final actions are either download or print your tags. It’s up to you to select the number of printed name tag copies you want to obtain. Just connect your printer to the computer and get free printable name tags at your disposal. 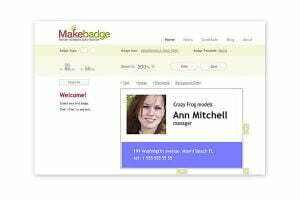 MakeBadge does not charge any fees for bulk name tag printing. Name tags for clothes or lapel tags are most frequent printable personal card types. You can print it with MakeBadge and place it under a plastic cover. Thus, employees will hook their name tags quickly. Besides, you can make tags for kids or luggage and print them too. Luggage tags or baggage tags are name tags for your travel bags. Unfortunately, sometimes your luggage can be lost in an airport, so you’d better make personalized luggage tags and put them on your suitcase. Thanks to MakeBadge, it’s easy to make luggage tag: go to the application, add your contact information with luggage return address and print custom luggage tags on your home printer. or press “Print” button and get printable name tag that you can automatically print. Hallo, mein Name ist – Name Tag. ONT-06. Hello, My Name Is – Name Tag. ONT-02. Ciao, mi chiamo – Name Tag. ONT-07. Olá meu nome é – Name Tag. ONT-05. See All the Free Tags on the MakeBadge. See the Video about how to create ID tags and badges using MakeBadge. The project was founded in 2011 as the simple badgemaking app, the all-in-one solution to compose and print all kind of badges, cards and tags quickly and without any hassle.